First of all I want to say thank you for the lovely birthday greetings from alliwantisanelf ireth06 nverland doylebaby jackieville dalehead and those incomparable ladies at the slash cave gattodoro and sylvan_lady for the "show" and the delightful seating. It was a marvelous day ending in a nice dinner and a showing of a new Doctor Who DVD that I received from hubbie. In other news I thought I'd show you what I have been up to since my last post. I will get back to posting about my summer adventures sooner or later but until then I thought I'd show you the results of a flower arranging class that I took. The last of my efforts is still sitting on my desk at work. You're very welcome, lovely!!! Oh my gosh!!! They are so gorgeous!!! Love them!!!! Thank you. The class was quite informative and fun. Who could do without internet for months? Not me. I'm glad your special day was a great one! And those arrangements are gorgeous! I'm good with putting flowers in a vase, but that is different stuff all together! The day was very nice from start to finish. The teacher who taught the class showed us all kinds of special tricks that I would never have thought of. It was a lot of fun. 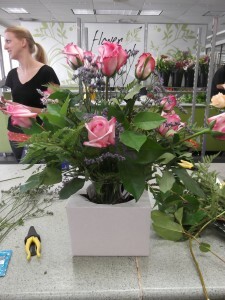 Those are all beautiful arrangements -- looks like the class was well worth it! 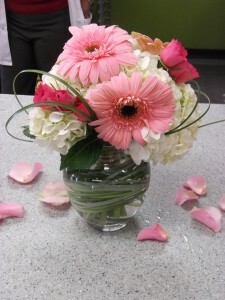 My favorite is the middle one where you have used the greenery to make it all swirly inside the clear vase. That's really clever! You are quite talented! I got Lee Pace (upcoming Thranduil) in "The Fall" on DVD for my birthday --saw it once on Netflix and really can't wait to see it again where I have more time to enjoy it without having to return! Rent it sometime if you have a chance, it was a very touching story! I'm glad you had a good day too. I wish I could say that the swirly stuff was my idea but that was part of the class. The teacher taught us all kinds of cool tricks. I hope to use some of them to teach my younger students some new things for their flower show this year. I'll have to check out that video. I'm glad you had a wonderful day. The pictures are beautiful! 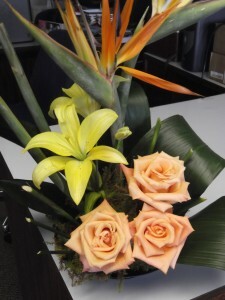 The flowers are lovely - you are very clever! I'm glad you enjoyed your birthday treat!